Despite the upsurge in rhetoric, US traders seem hopeful that this weekend’s dinner between President’s Trump and Xi will deliver a thaw in the trade war. That’s a chance and it’s helped stocks stabilise and recover from the lows. The US dollar was firmer across the board on the back of comments from Fed vice-chair Richard Clarida suggesting the Fed is still on track for more rate hikes. GBPUSD was under a little more pressure as forex traders worry Brexit has gone off the rails and gold and copper were lower. Now for Fed chair Powell Wednesday. Excuses abound today.An excuse for USD strength came in teh form of Fed vice chair Rich Clarida’s speech where he waxed positive about the US economy and the risks to the outlook. So the USD caught a bid and in DXY terms is back at 97.37. Euro is natraully down having lost 0.3% to 1.1295 while the Yen is off 0.2% with USDJPY at 113.77. The Pound lost ground as trader fret Theresa May won’t get the Brexit deal through the Commons, so GBPUSD is at 1.2734. The Aussie was buoyed by the stocks positiveity it seems and is at 0.7225 – up a smidge on the day. The Kiwi did best of the major traded currencies with a 0.33% gain to 0.6791 while the CAD lost the same amount with USDCAD rising to 1.3295. The other excuse was stocks. They could easily have got funky on concerns and tough talk about China and trade. But traders choose to pick the eyes out of Larry Kudlow’s little chat and hope for glasnost to break out at this weekend’s G20 meeting. At the close the S&P 500 is up 0.37% to 2,682. What’s solid about that – besides ignoring the potential bear points – is that it was a good 27 points, about 1%, off the lows around 2,655. Likewise the Dow was strongly off the lows and closed with a 0.44% gain at 24,478 while the Nasdaq was 0.34% higher at 6,701. Europe was lower, they missed the rallies in the physical markets. The CAC, DAX, FTSE, and FTSEMIB were all between 0.25% and 0.43% lower. Here in Australia after a solid test of support again yesterday the SPI is up 5 points at 5,739. On commodity markets the USD move and Clarida speech seem to have knocked gold a littleand it’s back down at $1,214 off 0.6% with silver down a similar amount at $14.12. Copper dipped 0.92% to $2.73 a pound while oil too’d and fro’d and bounced around the same low for the thrid day in a row. WTI is at $51.93 and Brent is up 0.4% up 0.6% and 0.4% respectively. Bitcoin is at $3,718 and US 2’s and 10’s contnued their remarkable stability and sit at 2.83% and 3.06% respectively. I wouldn’t rule out the chance of a deal being made between President Trump and President Xi at the G20 this weekend. But it feels like it would need some serious concessions on the Chinese side of the argument given the US is ramping up the rhetoric as we head into the meeting. Late Monday the Wall Street Journal (full transcript here) broke the news that President Trump is still of a mind to increase tariffs from 10% to 25% in January if a deal is to be done. And Tuesday his economic advisor Larry Kudlow said that while the White House is having “a lot of communication with the Chinese government at all levels,” as opposed to the “total standstill” previously where “nothing was going on”. But he tempered this apparent optimism by saying, “Their responses have disappointed because … we can’t find much change in their approach”. And that means “President Xi has an opportunity to change the tone and the substance of these talks…President Trump has indicated he is open – now we need to know if President Xi is open”. The ball is firmly in China’s court it seems. 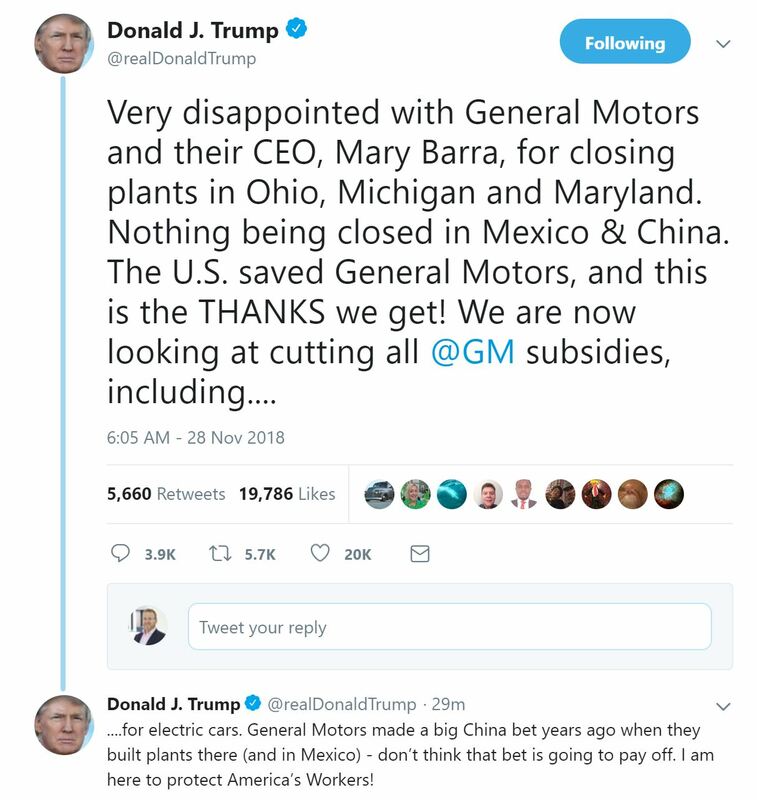 And as I suggested yesterday the GM plan to sack workers in the US has raised the ire of the President and restoked his protectionist/nationalist/MAGA fires. Why am I banging on about this? Because if the S&P 500 at 2,600 is the October low and Maginot Line before a much deeper fall or a very large bounce, then this meeting at G20 and the trade war is a key ingredient in how things turn out. So it is worth noting what President Trump said in the WSJ interview he wants from China, “make a fair deal. The only deal that would really be acceptable to me – other than obviously we have to do something on the theft of intellectual property, right – but the only deal would be China has to open up their country to competition from the United States…Otherwise, I don’t see a deal being made. And if it’s not made, we will be taking in billions and billions of dollars” [in tariffs]. China keeps talking about opening up, Liu He did it again Tuesday in Europe. So it’s not beyond the realms of possibility a deal can be agreed. But I’m not holding my breath – this week anyway. And about an hour ago Reuters broke a story quoting the Chinese ambassador to the US saying the two President had a “good working relationship and personal friendship” and that “the key to this solution is a balanced approach to concerns of both sides…We cannot accept that one side would put forward a number of demands and the other side just has to satisfy all these things.” So we’ll see, that doesn’t sound like a Chinese President who is going to fold. Fed vice-Chair Rich Clarida spoke overnight and the title of his speech – Data Dependence and U.S. Monetary Policy – can’t have left anyone in doubt about the signal he and the Fed are sending. DATA DEPENDANCE folks. It’s a clear sign the Powell Fed is a break from the Fed’s of recent chairs. Clarida’s apparent reaffirmation of support for further rate hikes – in contrast to the way his last speech was read dovishly – saw the USD catch a bid. Clarida said, “As the economy has moved to a neighborhood consistent with the Fed’s dual-mandate objectives, risks have become more symmetric and less skewed to the downside than when the current rate cycle began three years ago”. Which means (excuse his wonkishness), “As I have already stressed, r* and u* are uncertain, and I believe we should continue to update our estimates of them as new data arrive. This process of learning about r* and u* as new data arrive supports the case for gradual policy normalization, as it will allow the Fed to accumulate more information from the data about the ultimate destination for the policy rate and the unemployment rate at a time when inflation is close to our 2 percent objective” (my emphasis). So watch the data folks. Any weakness and we’ll see markets react well before the Fed does. President Trump tweeted against the Fed and OPEC recently noting that the oil price was down and he wanted it to stay down given its impact on price change and inflation and thus the Fed. As noted above Fed vice-chair Richard Clarida hinted at more rate hikes but made it clear the Fed is genuinely data dependant. On that note US indexed bond traders seem to be betting inflation is down with oil and will stay low. Either that or everything has become horribly short term in markets these days. Here’s a pic that floated past on ZeroHedge’s Twitter feed this morning. 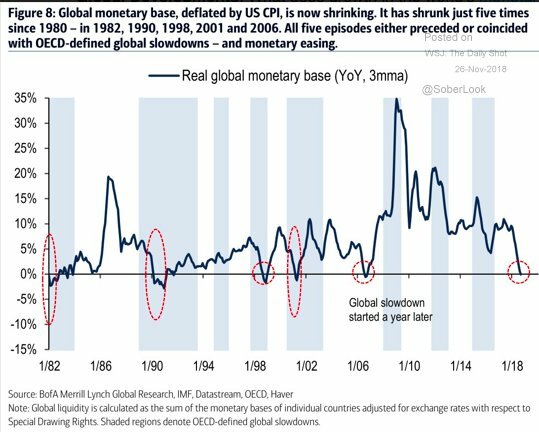 Or, maybe both oil and breakeven traders are noting that the global monetary base is shrinking. I am at my core someone who believes the growth in the money base and the velocity of money through an economy are big drivers, and reflectors, of aggregate demand and economic growth. It’s why I’ve got a jaundiced view on the Australian economy as demand for debt (money creation) falls. Anyway as you know the Fed is shrinking its balance sheet, the ECB is about to end it’s QE, bond buying and money creation project, and the global money base is falling. No surprises that there has been a global slowdown after each of the recent 5 episodes as shown in this chart. Can you see where the narrative is going? Slowing money base, falling oil, dropping breakevens, China slowdown, US growth past its sweet spot, global growth pulling back => stocks valuations! Anyway associated with this is the end of QE and the impact that will have on European corporate debt and the companies who have issued and relied on the ECB’s bond-buying program – EU corporate and junk spreads have been and are still ridiculously low. If you have the time have a read of this article in the FT for context – “ECB’s corporate exit leaves bond investors on edge”. Sterling traders are clearly worried that Theresa May’s deal for Brexit is going to fail in the Commons. But, if they were already factoring in a hard Brexit it’s likely GBPUSD would be down and through 1.2660 not still above 1.27. We’ll get updates from the government and the Bank of Engloand tonight.In the meantime here is the weekly GBPUSD chart for context should fear (or joy really kick off and the range break. As noted above the Pound is struggling under the weight of Brexit worries. That, along with the tone from Rich Clarida that suggests the Fed is still set to hike (even though James Bullard who may dissent is back as a voter next year and said last night the Fed should wait and see). So the DXY is firmly back above 97 this morning. It needs to close above 97.70 on at least a day basis, but certainly, a week would be good, for the break and run toward 100. And I know that the DXY is a derivative of the currencies that make it up, of which the Euro is ~57% so it that sense it is a made up currency for trading and representative of not much really given the weights. But it is influential in colouring folks views. Hence why I talk about it here. Back in 1998, when I first became a currency strategist – having been a fund manager before that, me and about 3 others were the only ones who talked about. Now folks talk about it as if its real. Go figure. A retest of the EURUSD trendline still looks on the cards but the level has slipped from yesterday’s 1.1260/65 to 1.1250/55. My sense is still that further slippage will likely to impact the Aussie, Kiwi, Pound but less so Yen as it depends on what stocks do. USDCAD is still constrained below the recent high which was also an original 138.2% projection from a previous move. A break and hold above there would suggest a further rally of 100 to 200 points toward 1.3520ish. OIL – Trying to base, three days of lows around the same level for both WTI and Brent suggest that there may be some selling fatigue in oil markets. We’ve been here before in this downdraft so its far from certain but we’ve also heard more from OPEC members about wanting to cut supply and get prices a little higher. And with the G20 meeting on the weekend likely to see the Saudis and Russians get together, there is hope that something will be ironed out before next week’s OPEC meeting. So we’re seeing $50 hold at the moment. So if it can then a base might form and WTI could rise toward $52.75, maybe even Friday’s high at $54.08 which roughly corresponds with this very steep downtrend line. For me the situation remains as I noted yesterday, call options in the back pocket with a little bit of time in them. Gold fell $8 dollars and looks set to retest back toward $1,200/$1205 while copper could be dropping back toward $2.64/67. Iron ore has been under pressure as China steel and steel mills come under pressure recently. Interestingly, coal has also been getting belted, thermal too. So it’s not just about China, though that’s the obvious narrative. Indeed here’s a little chart I shared on Twitter yesterday that shows a clear directional relationship between two big commodity exporters – Australi and Brazil – and their currencies. 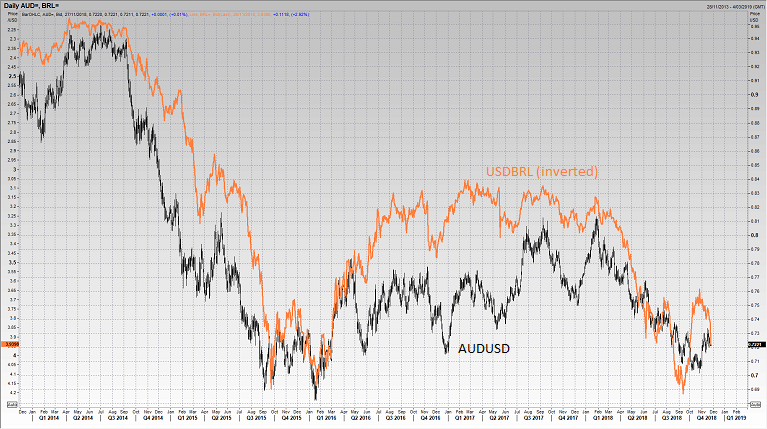 USDBRL is inverted so you can see it in the same terms as AUDUSD. The reason I raise this is that with everything going on in markets right now the washup is fair value for the Aussie has slipped 1 cent since last Monday. So the Aussie recent dip is perfectly contextual in terms of the drivers of the weakness outside of the USD. That also tells you the Aussie is just ebbing and flowing with the usual drivers. But what is important about that is on a medium-term basis if the slowdown that appears to be happening in Chinese and global growth continues, if copper stays offered, if iron ore keeps falling, and if the Australian economy does start to show signs of consumer fatigue – as I think it will – then the next leg of the downtrend could kick off. Obviously the USD is going to be a big part of that too. For the moment though the Aussie is trading inside the range of the candle from 2 weeks back still and only a break below 0.7160 or above 0.7335/40 will see it move in a material way. Short term, on the 4 hours, having broken below the little uptrend from that low around 0.7163 the AUDUSD needs to regain 0.7230/35 to push higher on the day. Below that the bias is down toward 0.7160/65. It has been a wild couple of days with clear support coming into the local stock market on dips. That is very positive price action and suggests that while the US markets hold up the buyers are seeing value in local stocks on the ASX and through them the Index and the SPI200 futures. Whether it can hold is as much a question of what happens offshore as what happens here in Australia. But for the moment a base is forming around 5,660/70 in SPI terms. 5,765 is now resistance.